Submitted Photo Pictured above is a snapshot of the 5th annual DFT Community Appreciation Day held earlier this year. DFT Communications recently held its 5th annual Community Appreciation Day at Steele Hall on the SUNY Fredonia college campus. The event is held each year as a way of saying thank you to the community for their continued business and support of DFT and is free of charge and open to the public for all ages. 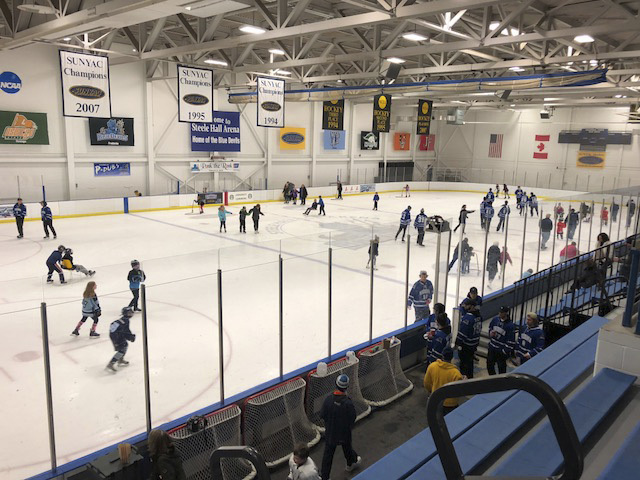 The two-hour event is hosted by the Blue Devils men’s ice hockey team in Steele Hall where a family community skate is held for the first hour and pick-up games with the hockey team are offered for the children in attendance during the second hour. Three individual rinks are set up on the ice and the hockey players split up evenly so that each section of the rink is covered. Many people in the community attended this year’s event and the SUNY Fredonia campus as Tim Horton’s provided coffee, hot chocolate and Timbits for all to enjoy during the event. Contests were also held with several prizes awarded from both DFT Communications and Fredonia State. Each guest also left with a free gift on behalf of DFT Communications. Planning will begin soon for this year and the 6th annual DFT Communications Community Appreciation Day.